The Yale Young African Scholars Program 2019 admissions decisions have been released. Please continue to check this website for 2020 admissions information. 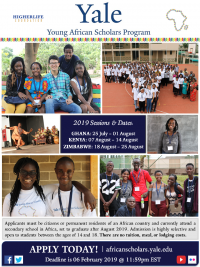 We anticipate opening our application sometime after the conclusion of YYAS 2019. Please note there is no cost to apply for, or participate in YYAS. While we share the same online application form as our sister program, YYGS, the application fee section only applies to students who wish to apply for both programs, or YYGS only. Students who ONLY wish to apply for YYAS should disregard the financial aid section of the application.